Recorded on February 23, 2014. Barry Allen sacrificed his life to save the entire universe. 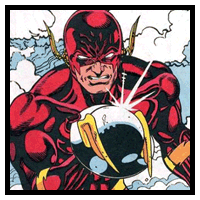 For years, his nephew Wally West has taken the mantle of The Flash – the Fastest Man Alive, to honor the memory of Barry’s heroic sacrifice. Now, suddenly, Barry has returned and ready to resume his life, but his erratic behavior hides a dark secret.